We just got home from my nieces' back to back graduation celebration- one was in elementary while the other was in high school. 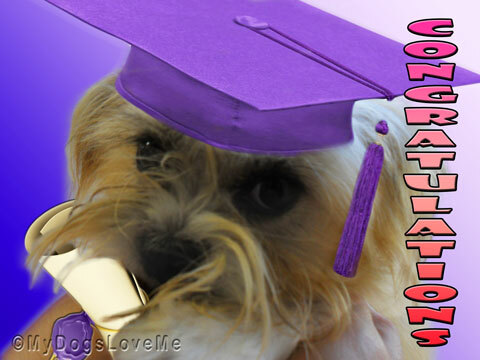 In behalf of the MyDogsLove.Me pack, Chooey would like to congratulate all the 2013 graduates. May you have a life filled with educational fun and adventures ahead of you. Congratulations to your nieces on their graduations! How exciting! Congrat to the graduates, Wow them guys are early, schools not out here until the end of May! Did you Graduate also, very nice motor board, the color looks good on you! 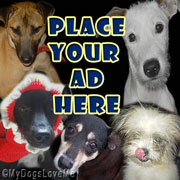 Congrats to the girls - that is pawesome! Looking good, Chooey. Congratulations to them all. Well done. We'll second that! Let's have treats all around in celebration. Tell the graduates congratulations for us! You sure are looking' good Chooey! Congratulations to both of your nieces may they have continued success! Chooey, you look SO academic!